Even though Microsoft retired Windows XP two years ago, an estimated 181 million PCs around the world ran the crippled operating system last month, according to data from a web metrics vendor. Windows XP exited public support on April 8, 2014, amid some panic on the part of corporations that had not yet purged their environments of the 2001 OS. Unless companies paid for custom support, their PCs running XP received no security updates after that date. Consumers were completely cut off from patches, with no alternatives other than to switch to a newer operating system or continue running an insecure machine. The 12% represented approximately 181 million PCs when compared against the 1.5 billion Windows personal computers worldwide, a number that Microsoft has regularly cited. That number put XP as No. 4 among Microsoft's editions, behind Windows 7, which powered an estimated 861 million systems, Windows 10 (235 million), and Windows 8/8.1 (199 million). Windows XP's user share also exceeded that of all versions of Apple's OS X by 40%. While XP's usage share of the U.S. market was a minuscule 3.2% -- less than half the global average of 7.5% -- XP last month remained a strong contender in the People's Republic of China (PRC). There, XP accounted for 26.2% of all personal computer operating systems as measured by Irish analytics company StatCounter. China has an even bigger XP problem according to Baidu, the PRC's largest search provider. Data from Baidu pegged XP's share of the country's OS market at 31.6% for March, a significant decline from 44.1% a year ago but still almost a third of all PC OSes. Microsoft has launched several initiatives in the PRC to get customers there to upgrade to a newer version of Windows. Last fall, for example, Microsoft partnered with Baidu to promote Windows 10 adoption. In return, Baidu was made the default search provider for the Chinese version of Windows 10. At XP's current 12-month rate of decline as tracked by Net Applications, the operating system will drop into the single digits in May, but will remain above 5% until March 2017, nearly three years after its expiration. Part of the difficulty in leaving XP is that there is no direct migration between it and Windows 10, Microsoft's latest edition. Instead, users must first upgrade to Windows 7, then next to 10. Or more likely, dump the system and purchase a new PC with Windows 10 pre-installed. 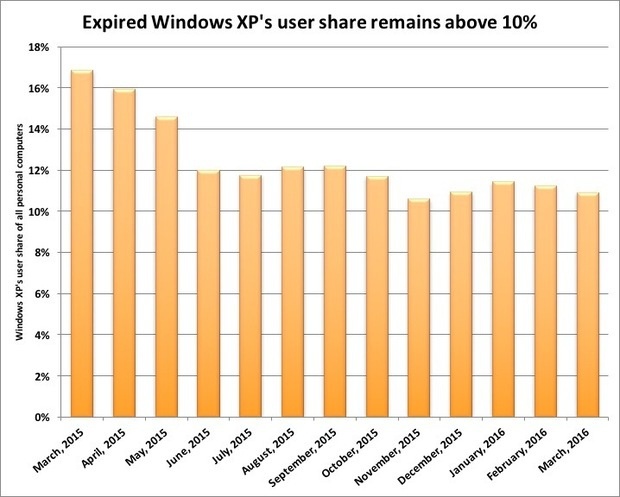 Two years after retirement, Windows XP's user share stubbornly resists falling into the single digits.